What The Furkini Is Up With Kim Kardashian? Kim Kardashian is in hot water with animal activists yet again - this time over a fur bikini. On Tuesday, Kardashian tweeted photos, taken by husband Kanye West, of herself standing in the snow wearing what appeared to be a fur bikini and furry boots. While it remains unconfirmed whether or not the fur was real, PETA tweeted a response from its Senior Vice President Dan Mathews: "Sad someone so beautiful chooses to create such an ugly legacy." This is not the first time Kardashian has been criticized by PETA for her lack of animal-consciousness. 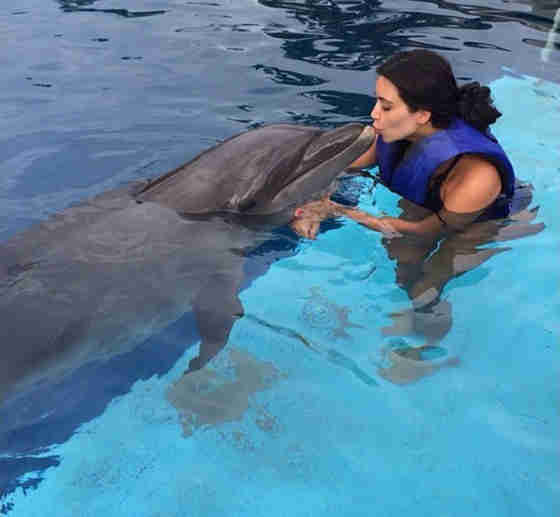 Last August, the organization was irate when she shared a video of herself swimming with captive dolphins. The Dodo has requested comment from Kardashian's publicist, but did not immediately receive a response.